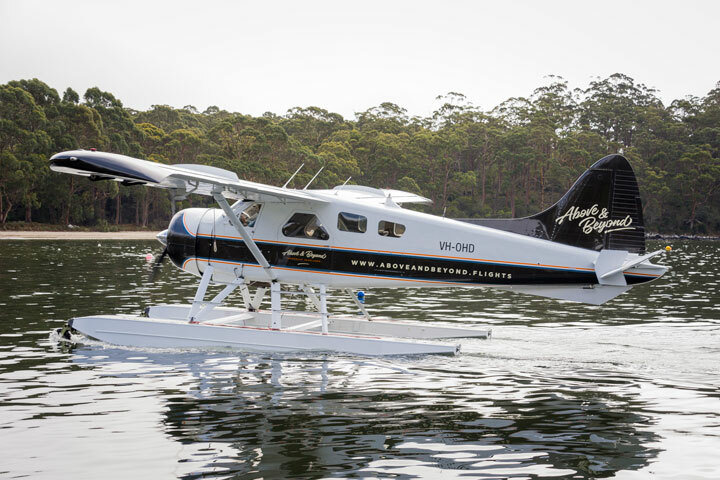 Above and Beyond (Tasmanian Seaplanes Pty Ltd) is a Tasmanian owned company that takes great pride in showing off their beautiful island state to locals and visitors alike. All their pilots have travelled the world, flying all kinds of aircraft, for a variety of organizations. They are fully compliant and up to date with all the latest industry regulations and maintain a strict maintenance program for their aircraft. Their aircraft is an eight seater (including pilot) de Havilland Beaver – one of the most iconic aircraft in the air and the ‘ultimate flying machine’ according to many aviation buffs. It has been customised with leather interior and fitted with state-of-the-art equipment by one of the worlds leading aviation refitting specialists – Kenmore Air, in Washington USA. It’s an amphibious aircraft, which means we can take off and touch down on land or water. This enables a service to be provided that can see guests safely touching down in some of the most remote parts of Tasmania in a fraction of the time it would otherwise take – without raising a sweat, sparkling wine at the ready, in comfort and style.